Eric here! If you’re unfamiliar with Trinket Studios, I’m the artist on the 3 man team. On Trinket’s first two games I worked alone but I’m very grateful to have some help this time around for the duration of the demo work at the least. Christine Chong, whom I’ve known pretty much since childhood, will be helping me color in a few of the animations for the monsters in the game! Yann Blomquist, one of my dear college friends, will be tackling the background environment art for the demo. I couldn’t be happier to have their assistance! 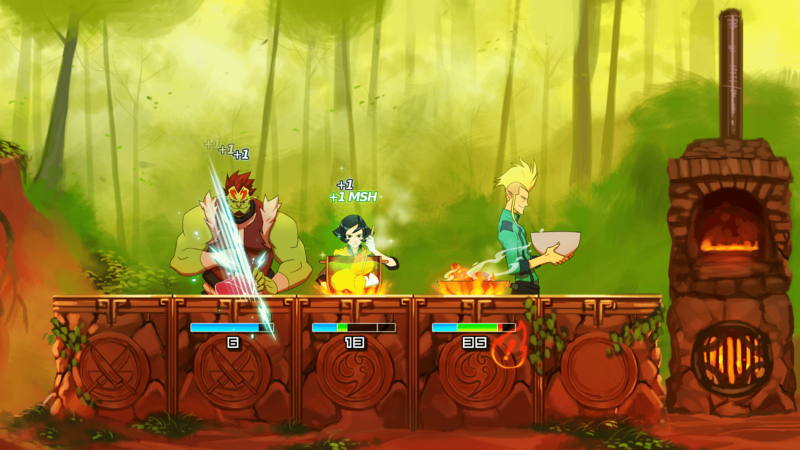 To start things off in this dev blog, here is the very first mockup I made of Battle Chef Brigade. Since the beginning we’ve wanted this to be a 2d side view game. We’re all fans of parallax for one thing, but ultimately this presentation gets the best leverage out of my (pretty limited) skill set, which is drawing things… with simple straight forward perspectives. In spite of the “battle” part of our title, here all the chefs are on the same team. The girl (later to be Mina), is the head chef while the other two are sous chefs. 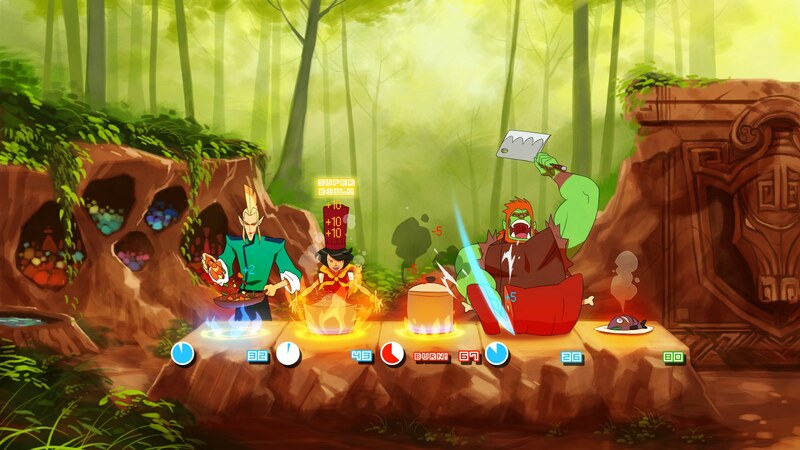 This is a direct parallel to one of our main inspirations, Iron Chef (Japan), which typically had 3v3 cooking bouts. 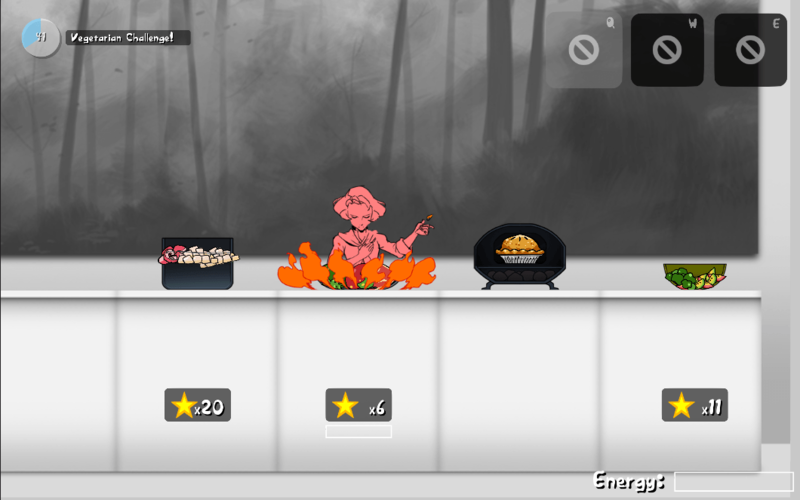 We also wanted there to be some old school RPG elements, as you can see in the points coming off the food, and the magical presentation of the cooking. Down the road I modified the perspective to be more severely straight on. The former perspective had some problems with an all 2d world. If any artists out there have some interest in discussing more about this, feel free to comment here and I could go more in depth. There are plenty of pros and cons with either perspective. The below image shows the updated perspective as well as Mina when she came further along in concepts. Pots and pans also gained the ability to become see through! The “+1MSH” is there because at the time, cooking began to involve textures for the food (mushy, tough, crispy and more). That design path has since been abandoned to leave room for other kinds of headaches! Right now the game world is a bunch of misty grey shapes, for more flexibility to try things. Mina has minimal animation in both cooking and fighting to do all the basics we want to have. Below is a screen shot of the current state of the prototype. The food art is completely throwaway work just to get things moving. Posting this has reminded me that it’s probably time to have a new target image based on all the updates we’ve made design wise. There’s a lot to do and things like this really help to get the team all on the same page. Hope this was interesting as a first dev post! You’ll certainly hear from either Tom or Ben for more technical stuff in the future. Have a good weekend folks!